WEST PALM BEACH, FL – Eddy "Rawsrvnt" Puyol is putting it all on the line. "My life is literally unraveling in front of the public's eyes. I don't know exactly how to maneuver, share, or talk about it - but it hurts. And as raw and honest as I've always been both on and off the stage, it makes sense that people hear it directly from me," Eddy "Rawsrvnt" Puyol said. The "it" is a yearlong separation from his wife and their two young girls. Although there were attempts made alongside church mentors and counselors, the couple ultimately could not reconcile their relationship and marital divorce proceedings are currently underway. Such events provide even more depth to the lyrics of his latest release; a song and video with Japhia Life titled "On the Line." In it, Rawsrvnt's words double as love letter to his children – especially in the midst of this disruption. "I recognize now the peace that God was giving me as I was writing this record. Even though I couldn't have seen it at the time, He spoke through my pen to share a sense of comfort in knowing He is in full control," Rawsrvnt said. It's a vibe the artist also wanted to capture in the song's visuals. "I shared my heart with videographer Joel Davis (aka Geek formally of the group Surf Gvng) when we were talking through this part of the project. I wanted it to have a street feel, but with palatable serenity. I think we succeeded here," Rawsrvnt said. Filmed in Miami (Rawsrvnt's birthplace), the video switches between darker scenes shot in front of the city's iconic, art deco Colony Hotel and a beautiful sunset at South Beach. The dichotomy is striking and further emphasizes the storyline of the song and its relevance to the artist's current life journey. "I hope the audience will accept it in full. I know my kids will appreciate it later too – just seeing how this played into their story and how much their dad loved them with a love that will never go away," Rawsrvnt said. "I pray it communicates the same love the Heavenly Father has for us and that even when parts of life are tough and relationships fail, He's always there waiting with open arms." Video: Rawsrvnt "On the Line (feat. 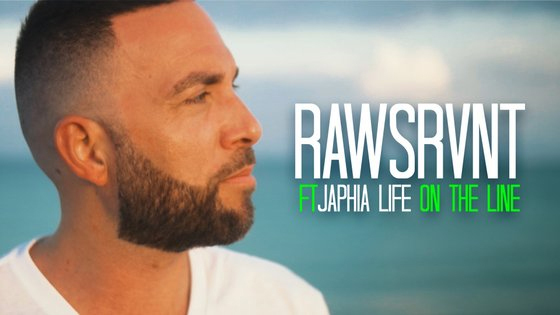 Japhia Life)"
Rawsrvnt's Shut It Down EP is available now on all digital outlets.